Varnado is a Redguard smith and joint owner of The Best Defense in the Market District of the Imperial City. He sells Heavy Armor and provides advanced training in using it. He also offers repair services. The unique Aegis of the Apocalypse can be purchased from him only. He shares ownership with Light Armor specialist Maro Rufus, but because neither of them respects the other's preferences in armor, the atmosphere in The Best Defense is notoriously bad. As a result, Maro sleeps in the basement while Varnado sleeps in the living quarters above the shop. After waking up at 6am, he heads downstairs and eats a two-hour breakfast with Maro before unlocking the door for customers at 8am. He spends the next twelve hours offering his various services, until he closes up shop at 8pm and leaves. On all normal weekdays (Morndas to Fredas) he takes his dinner at The Feed Bag while chatting to the other merchants and traders. On Loredas and Sundas, he will take an evening stroll around the Green Emperor Way. He always returns to the shop and his bed at midnight. During the day, he is equipped with a steel cuirass and wears a pair of laced leather pants and thick cowhide shoes. When he is asleep, he un-equips the cuirass and puts on a more comfortable dark green shirt. He carries the shop key and a small amount of gold. When you approach him for the first time, it becomes apparent that he might not be the easiest person to work with: "I'm Varnado. I handle the Heavy Armor at 'The Best Defense'. I'm also an Advanced Trainer in Heavy Armor, so I know what I'm talking about." And if you ask him about the Imperial City, he will point you towards his partner with an insult: "You want Light Armor? Pah! Why wear fluffy flutter, when you can wear real armor? But if you MUST have Light Armor, talk to Maro Rufus. Idiot." As an advanced trainer, Varnado can provide you with the necessary reference for the Heavy Armor Master Training quest. Once your heavy armor skill level reaches 70, speak to him, and choose the "training" option, which will trigger the quest and this dialogue: "The only one who can teach you anything more about Heavy Armor is Pranal. A master gladiator back in his day, he was. I think I heard that he'd retired, and was living out his days at the old Roxey Inn here in Cyrodiil. You might try there." Other people know about Varnado's skill with heavy armor, and point you towards him: "If I had a question about heavy armor, I'd probably ask Varnado at The Best Defense." Varnado was supposed to pay a visit to the Temple of the One on Sundas from 8am to midday. However, this never happens since his package that compels to offer services is the second to load on the list and thus it will always override this schedule. 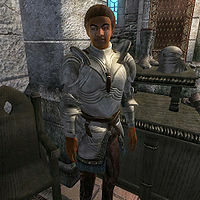 Varnado is a member of the Chorrol Citizen faction, even though he isn't related in any way to Chorrol. This page was last modified on 17 August 2018, at 12:55.